Thirty-three thousand signatures to the Suffrage petition were obtained in less than six months. It was the largest petition that had ever been presented to Parliament on any question and tremendous interest was aroused when the bulky document was carried by several attendants into the legislative chamber. Goldstein, V ca.1902–1919, Woman suffrage in Australia [microfilm], MSM 118 Vida Goldstein Papers, Manuscripts Collection, State Library of Victoria, Melbourne, Vic. The ‘Monster petition' was signed by both men and women. The complete petition is available online and you can search to see who signed it. The 'Monster Petition' was 260 metres long and 20cm wide, and several attendants were needed to carry it into parliament when it was tabled in September 1891. But despite the dedication of the petitioners and the obvious support of tens of thousands of Victorians, the Victorian Upper House firmly refused to give the women of Victoria the same voting right as men. South Australia granted women the right to vote in 1894; Western Australia followed suit in 1899, and New South Wales in 1902. That same year women Australia-wide were granted suffrage in Commonwealth elections. Strangely, this meant that women in Victoria could legally vote in federal elections, but not state elections. Frustrated by the situation, some younger members of the suffrage movement took matters into their own hands. In 1903, they formed the Women's Federal Political Association, of which 'that dangerous and persuasive woman', Vida Goldstein, was President. As part of their media campaign, the Association also promoted Goldstein as a candidate for state parliament, an even more radical idea than allowing women to vote. After 17 years and 19 private member' bills, Victorian women finally gained the right to vote when the 19th Bill was passed on 18 November 1908. 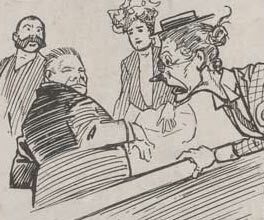 Tasmania had passed its own legislation on this matter in 1903, as had Queensland in 1905, making Victoria the last state in Australia to grant women the right to vote in state and federal elections. Indigenous women had to wait until 1962, when the repeal of the 1902 Commonwealth Act gave Aborigines in all states, except Queensland, the right to vote. 2008 celebrates the Centenary of Women's Suffrage in Victoria, honouring past generations of women in their quest for equality.